A Liebherr LH 22M material handler loading a container. 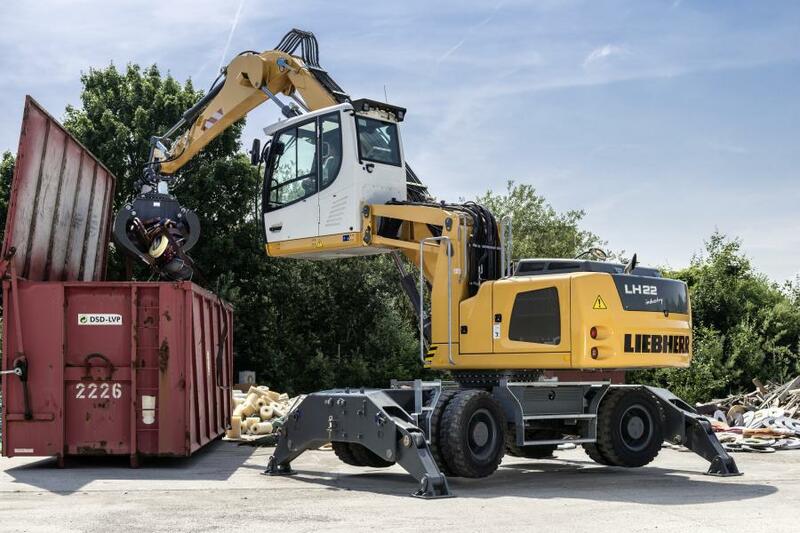 Liebherr USA Co. Construction Equipment division is displaying two high performing material handlers and the L 550 XPower wheel loader at the Institute of Scrap Recycling Industries 2019 convention and exposition in Los Angeles, Calif.
Liebherr will display the LH 22M and LH 30M material handlers and the L 550 XPower wheel loader at ISRI 2019 from April 8 through 11. More than 5,000 recycling industry professionals from across the United States and the world are expected to attend the event at the Los Angeles Convention Center. The LH 22M material handler has a reach of nearly 33 ft. (10 m), and a sturdy, compact design, which makes it particularly suitable for deployment in the area of recycling. It has the latest engine and hydraulics technology, developed in-house by Liebherr. The LH 22M is equipped with a fuel efficient 143 hp (105 kW) engine that meets emissions standard IV. The LH 22M and LH 30M both feature a 4-cylinder inline diesel engine from Liebherr. The LH 30M produces 190 hp (140 kW). This strong engine output results in more available torque for powerful machine movements, according to the manufacturer. Load peaks are intelligently managed, which allows maximum torque availability at all times. These material handlers combine intelligent electronics with sensitive hydraulics and ensure precise and finely controlled work with fast and powerful movements. Speed and power are available whenever they are needed. Liebherr's engine technology features intelligent machine controls that optimize the interaction of the drive components to ensure maximum efficiency and power. Liebherr-Power Efficiency (LPE) enables machines such as the LH 30M to operate with the lowest specific fuel use while maintaining maximum performance. At ISRI 2019, the LH 22M will be on display with a Liebherr sorting grapple and the LH 30 will have a Liebherr type 64 grapple. Attachments are available to suit any application. The components are configured for a long service life even when subjected to heavy lateral stresses during demanding tasks. Liebherr offers a wide variety of attachments, machine options and configurations to meet specific application requirements. The operator cab of the LH 22M and LH 30M offers premium conditions for healthy and productive work. The foldable left armrest permits easy and safe entry into the cab. Smooth, precise steering movements are conveniently performed using the joystick, eliminating the need to reposition hands during the work cycle. Replacing the steering wheel in favor of joystick steering provides additional legroom and a clear view of the working area. The Liebherr L550 XPower wheel loader on display at the ISRI 2019 exhibit booth features the full guarding package offered, which protects vital areas of the machine. The wheel loader also has particle protection and an air pre-cleaner. This, combined with the optimal placement of the cooling package, prevents debris contamination in the cooling components, according to the manufacturer. The Liebherr-XPower driveline, paired with Liebherr-Power Efficiency considerably increases machine uptime and fuel efficiency. Together this design reduces the wheel loader's fuel consumption by up to 30 percent when compared to conventional travel drive systems. In addition, the Liebherr-XPower driveline brakes automatically. The service brake acts only in a support function and is therefore subject to minimal wear. A continuous tractive effort control of the XPower driveline prevents wheel spin. Combined with automatic self-locking differentials, tire wear is reduced by more than 25 percent. Finally, gaining access to the engine on Liebherr XPower wheel loaders is safe and easy. Operators can easily reach checkpoints and critical maintenance points on the machine, which means faster turnarounds and more uptime. For more information, visit www.liebherr.com.